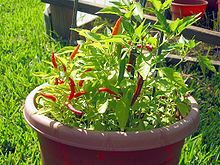 For a similar Capsicum cultivar found in Asia, see Bird's eye chili. For the herb, see Justicia pectoralis. For the Kenyan musician, see Pilipili. Piri piri (/ˌpɪri ˈpɪri/ PIRR-ee-PIRR-ee, often hyphenated or as one word, and with variant spellings peri peri or pili pili (also called bird's eye chili)) is a cultivar of Capsicum frutescens, a chili pepper that grows both wild and as a crop. It is a small member of the genus Capsicum. The cultivar was developed from the malagueta pepper (originally from the Caribbean) in southeastern Africa and was spread by the Portuguese to their Indian territories of Gujarat and Goa. Peri peri is Swahili for 'pepper pepper', or 'strong pepper' (the reduplication of the word is an intensifier). Other romanizations include pili pili in the Democratic Republic of the Congo or peri peri in Malawi, deriving from the various pronunciations of the word in different parts of Bantu-speaking Africa. Peri peri is also the spelling used as a loanword in the Portuguese language, especially in the Portuguese-speaking Mozambican community. The piri-piri spelling is common in English, e.g. in reference to African-style chili sauces. 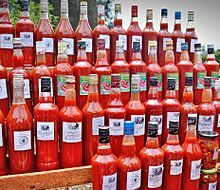 The Oxford Dictionary of English records piri-piri as a foreign word meaning "a very hot sauce made with red chilli peppers", and gives its ultimate origin as the word for "pepper" (presumably in the native-African sense) in the Ronga language of southern Mozambique. Plants are usually very bushy and grow in height to 45–120 cm (18–47 in) with leaves 4–7 cm (1.6–2.8 in) long and 1.3–1.5 cm (0.51–0.59 in) wide. The fruits are generally tapered to a blunt point and measure up to 2–3 cm (0.8–1 in) long. Immature pod color is green, mature color is bright red or purple. Some Bird's eye chili varieties measure up to 175,000 Scoville heat units. Like all chili peppers, piri piri is descended from plants from the Americas, but it has grown in the wild in Africa for centuries and is now cultivated commercially in Zambia, Uganda, Malawi, Zimbabwe, and Rwanda. It grows mainly in Malawi, Zambia, South Africa, Ghana, Nigeria, Zimbabwe and Mozambique. It is cultivated for both commercial food processing and the pharmaceutical industry. Cultivation of piri piri is labor-intensive. Sauce made from piri piri chilis (used as a seasoning or marinade) is Portuguese in origin and is also "especially prevalent in Angola, Namibia, Mozambique and South Africa". It is made from crushed chillies, citrus peel, onion, pepper, garlic, salt, lemon juice, bay leaves, paprika, pimiento, basil, oregano, and tarragon. ^ Stevenson, Angus, ed. (2010). "piri-piri, noun". Oxford Dictionary of English. Oxford University Press. ^ "The Scoville scale". www.alimentarium.org. Retrieved 20 February 2019. ^ a b "Pepper Profile: African Birdseye". Fiery Foods and Barbecue SuperSite. Retrieved 27 December 2011. ^ Rowley Leigh, "A Fiery Challenge for Delicate Palates", The Financial Times, London, 25 September 2004, p. 6. ^ Bender, David A., ed. (2009). "piri-piri". A Dictionary of Food and Nutrition. Oxford University Press. doi:10.1093/acref/9780199234875.001.0001. ISBN 9780199234875. Retrieved 24 February 2013.